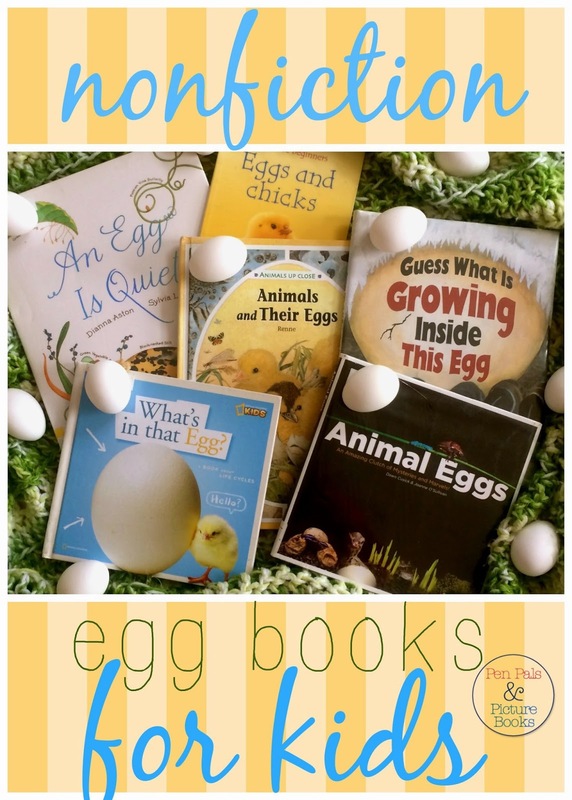 Below you'll see a few images from each book in case you're on an egg hunt for something specific in your nonfiction search. Enjoy! 1. An Egg Is Quiet by Dianna Aston and Sylvia Long is gorgeous. Of all of the books on this list this is the one I must own. It's really interesting too. It's a wonderful book. 2. We've dedicated several posts to Ruth Heller. We couldn't leave her out when talking eggs. In her World of Nature Series Chickens Aren't the Only Ones is about all types of eggs and creatures that lay them, and it rhymes. Love it! 3. 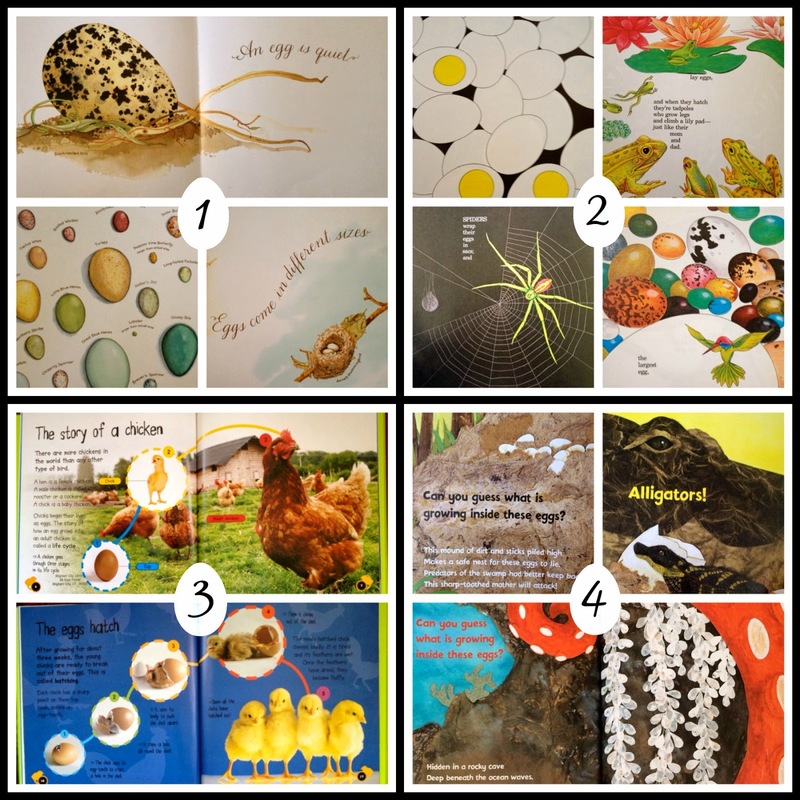 Egg to Chicken (QEB Life Cycles Series) by Camilla de La Bedoyere. In this book you'll find all of the facts with beautiful photo illustrations. It's easy to read and easy to understand. Very cool. 4. Guess What Is Growing Inside This Egg by Mia Posada is set up as a sort of guessing game. You read the clue about the eggs and turn the page to find out what's inside. I'm also a big fan of the textured, cut paper-ish looking art! 5. 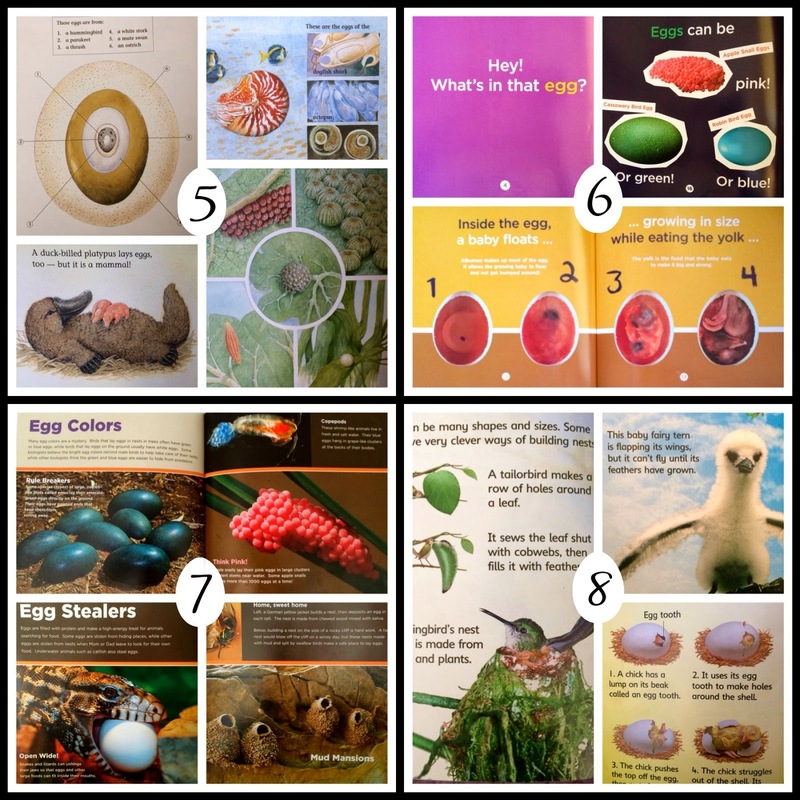 Animals and their Eggs by Renne from the Animals Up Close Series, appears to be one you'll have to find at your library. The pages are filled with soft, warm illustrations. I really like the set up: lots to look at for the tots, and plenty of facts for bigger kids. 6. Here's a cool book! National Geogrpahic Kids What's in That Egg? by Becky Baines has graphics mixed with photo images. It's fun to look through and easy to read. 7. Animal Eggs: An Amazing Clutch of Mysteries and Marvels by Dawn Cusick and Joanne O'Sullivan-- the photographs in this book are big and bold and just plain fantastic! Pair them with facts on everything you'd ever want to know about eggs and you've got a winner! 8. Eggs and Chicks (Usborne Beginners) by Fiona Patchett makes use of photographs and drawings about all kinds of birds. It's got great information in an early reader from, perfect for young nonfiction lovers.